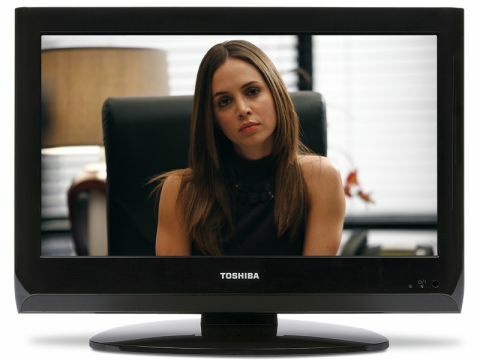 Toshiba has established a strong presence at the budget end of the market and the 19AV615 continues the trend of providing a decent performance combined with a wallet-friendly price tag. Importantly, for an affordable set, the screen manages to look quite pretty, thanks to its glossy finish and decent build quality, and it's also available in white and black options. It's nice to find that the 19AV615 is built to a true 16:9 aspect ratio, with a 1,366 x 768-pixel resolution. Elsewhere, the set covers all the connection bases, but the fact that there's only a single HDMI might require a bit of cable swapping. This seems fair enough, given how cheap the set is. A reasonably attractive and legible set of onscreen menus, meanwhile, provide far more picture tweaks than we'd expect to see on such a low-rent TV. Highlights include backlight adjustment, a handy set of picture presets, a Cinema mode, noise reduction routines, colour transient improvement processing, flesh tone adjustment, plus adaptive luma control for automatically adjusting the brightness and contrast based on an analysis of the image content. It's a relief to find that the 19AV615 has a dynamic backlight system, too, as it's a feature that's by no means standard on budget TVs of this kind, but which is generally key in producing convincing black levels on LCD TVs. Thanks to this feature, while the 19AV615 doesn't produce the sort of cinematic black levels seen on some larger and more expensive TVs, its blacks are at least deep enough to allow dark scenes to look reasonably layered and credible. The black level strength helps the TV produce some reasonably vibrant and credible colours, too, and the dynamism is further enhanced during HD viewing by a solid ability to reproduce the format's extra crisp detailing. Inevitably given its price, the 19AV615's pictures aren't perfect. There's minor backlight bleed along its top and bottom edges, slight motion blur, colour blends look slightly unsubtle at times and skin tones can occasionally look a touch too plasticky. The set's dual 3W speaker power initially doesn't impress either, with a severe lack of bass and a rather muddied mid-range apparent when showing anything vaguely resembling an action scene. But, the day is saved by a pseudo surround sound mode, which gives the soundstage a surprisingly broad and far-reaching range. The only question that's really reasonable to ask is whether this TV outperforms its price point and the answer is a resounding 'yes'.